Synara’s Score immediately puts into motion the consequences of the previous episode. I think that has been this series’ strong suit thus far, consequences. We haven’t had character deaths, or falling outs, or anything like that; but in terms of the machinations and parties on the Colossus things have been building upon one another at a great pace. The episode revolves around the Colossus being barely able to keep its head above water as is, with just the latest struggle being a busted targeting system for the stations turrets right as the Aces need to leave. All the while Yeager’s team tries to fix the computer, they interact with Synara who very quickly deduces the station’s vulnerability. The intelligence of our characters was one of the most easing things about this episode. Even in TCW there where those moments of characters just making idiotic decisions in order to further the plot. However Resistance has managed to often have characters figure out what is going on, without leaps in logic or another character being an idiot. Tam and Kaz do a solid job of keeping the targeting computer under wraps, and Synara puts two and two together simply by being good with tech and deduction. We also get some decent bonding moments between Tam and Synara, showing that Tam is not inherently mad all the time. She is just surrounded by idiots, or people who she feels will betray her…….and now she relates to Synara who is legitimately an enemy spy. This is not going to end well for Synara is it? All of this amps up to a pirate attack on the station. This entire episode has let Kaz be smart and, while goofy as we should expect, focused; which wonderfully culminates in Kaz getting to really shine as a hero. 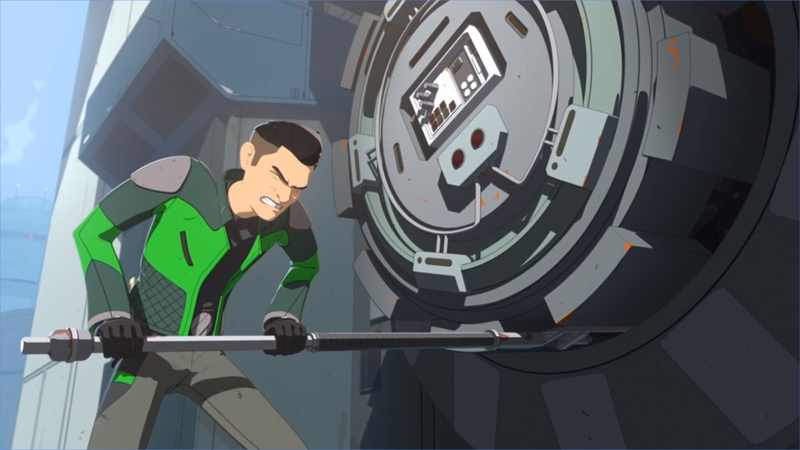 We had seen him save the station during the last attack, and fight some off last episode, but here we see Kaz have to contend for a prolonged fight right in the thick of it. Tam runs off to help Synara when the pirates attack the loading docks, while Kaz and Yeager try to install the now fixed targeting computer. 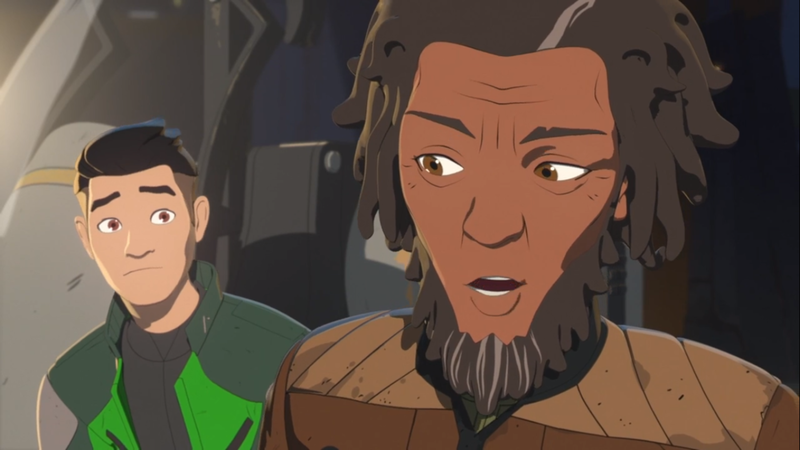 One of the best moments of the series so far is Kaz saying that he needs to go with Tam to help Synara, only for Yeager to remind him they have a job to do, to which Kaz instantly agrees with and snaps into action. For all his shenanigans, Kaz is a soldier with a job to do and that is really the thing that he and Yeager both have in common. Kragan himself fights with the two, leading to a good fight, that gives us a taste of Yeager’s piloting skills and Kaz’s ingenuity which we saw in episode 1. Despite our heroes saving the station, it is still wrecked pretty severely. Having proven how delicate the security of the station is, the First Order has finally gotten their wish as Captain Doza agrees to discuss terms with Pyre. Meanwhile Yeager brings up the the idea that there are more spies than Kaz on the station. While obviously Synara is involved, Yeager’s points include some events outside of what she new, making me wonder if he suspects someone directly working with the First Order. I have to assume there is someone there with direct FO ties, seeing as Synara is only working for the pirates and only became a spy by accident. This episode was fantastic, two acts of nice character building and interactions, with frankly our first fight with most of our characters directly in the thick of it. Bosco Ng was a fantastic pick to direct, given his loads of experience of TCW and Rebels; including some of the best episodes like Wolves and a Door”, “Tipping Points”, and my favorite episode of Star Wars animation “In The Name of the Rebellion part 2”. Mr. Ng did a fantastic job making an exciting action sequence out of a fight that did not seem to have any deaths or serious injury. 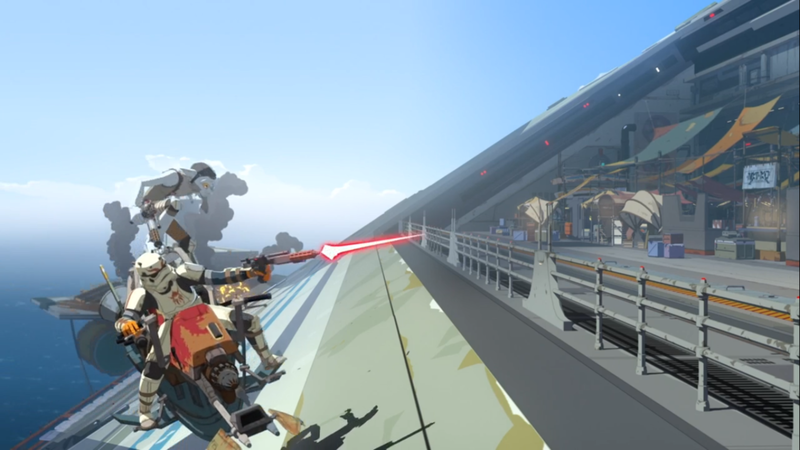 It made me realize why fights like this can manage to be more interesting than some fights in Rebels and even TCW; raids like this are on our heroes’ home. We can see clones and battle droids killing each other and the intensity is much higher inherently, and the Rebels can fight off AT-ATs, but when the action feels basic and no one we care about is in danger, or in Rebels when no one dies on either side so the stormtrooper don’t even feel like they could be a thread; the audience loses something. Here a character is seriously hurt though, The Colossus, and in the process her freedoms are being given up by Doza out of fear. My friends and I compare this show to DS9 almost every time we praise it, and this is perhaps the biggest reason why. The location is not just a base like a ship like the Ghost or the Enterprise D are, but rather it is a functioning community that is stationary. We have to get connected to not only the location, but the local politics.